Sometimes, improving patient safety while lowering costs can feel like an impossible task. But at the University of Iowa Hospitals & Clinics’ Anemia Management Clinic, it’s a daily occurrence. “When we use fewer units of blood for transfusions during or after surgery, we lower the risk of complications and death during or after surgery, and we lower the hospital’s costs,” said Sundara Reddy, MBBS, FRCA, Medical Director of the Anemia Management Clinic. 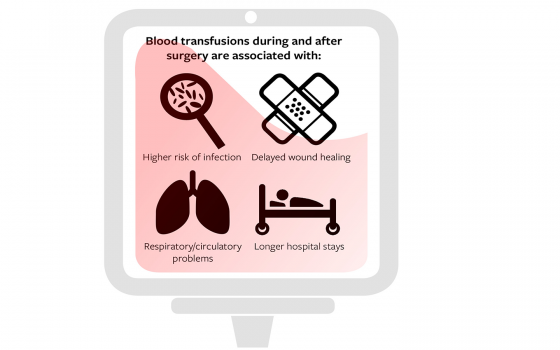 Transfusion issues can include infection, delayed wound healing, immune suppression and/or allergic reaction, and even respiratory and circulatory problems. Anemia, or low levels of red blood cells, is a strong predictor for blood transfusions during or immediately after surgery. According to the National Heart, Lung and Blood Institute, more than 3 million Americans are anemic, and the most common cause of anemia is iron deficiency. As many as 3 in 4 surgical patients may be anemic, Dr. Reddy said.For those patients, treating anemia before surgery can dramatically improve outcomes across the board. Dr. Reddy identified 1,000 high blood-loss surgeries – such as cardiac, spine and bladder cancer surgeries – performed at UIHC in fiscal 2013. Tranfusions were required in 350, or 35 percent, of those surgeries. Dr. Reddy estimated those surgeries used a total of 700 units of blood products (mainly red blood cells, but also plasma and platelets, the cells responsible for clotting). He calculated the hospital might have saved up to $350,000 if the patients had been treated for anemia before surgery. Blood transfusions also are associated with longer hospital stays – slightly more than two extra days on average – and the cost savings there could have been $1.6 million or more, Dr. Reddy said. For every 700 units not transfused, Dr. Reddy calculated there could be 18 fewer complications and two fewer deaths among patients. There’s another benefit to lower transfusion rates: It helps ensure blood supplies are available for trauma, cancer, and other patients who don’t have time to be treated for anemia before surgery. Ideally, anemia treatment should begin at least four weeks before surgery. Donor Center Supervisor Kerry DuBay, MA, said DeGowin collects about 350 units of red blood cells in an average month, so the 700 units identified by Dr. Reddy represent a significant portion of the Center’s annual collection. And January is a good time to donate. Not only is it National Blood Donor Month, but blood donations typically dip sharply during the winter months because of the holidays and cold and flu season. All DeGowin blood donations stay within UIHC, so donating at DeGowin benefits both UIHC patients and the hospital’s bottom line. Visit the DeGowin Blood Center for donation information, eligibility criteria, and to schedule an appointment.